Colossus, the frame set that can take all the grunt a rider can give it and this frame will give it all back. The Colossus of Rhodes was a statue of the Greek titan-god of the sun Helios and stood over 30 metres high on the Greek island of Rhodes, making it one of the tallest statues of the ancient world circa 280BC. is it because the Marvel hero Colossus can transform his body tissue into an organic, steel-like substance that grants him, superhuman strength? 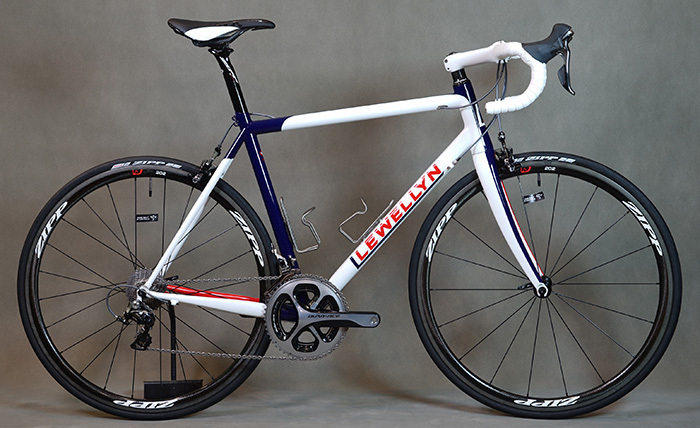 The inspiration for this Llewellyn frame set came from conversations between Dr Brian McLean (Cycling biomechanist) and myself about the possibilities of a new Llewellyn model with traits he desired. The new frame is designed to be very stiff by using a careful selection of Columbus tubes starting with the large thin walled HX shaped 44mm diameter down tube from HSS range which offers the greatest lateral and torsional rigidity. The seat tube selected uses a standard 31.6mm seat post. The back bone of the frame’s main triangle is a fully round 35mm diameter top tube for maximum resistance to torsional stress but giving vertical compensation. A tapered head tube connects the main tubes to the front end along with the Columbus Grammy 1.5” carbon fork to the front wheel. Special large 18mm diameter seat stays and MAX chainstays connect the rear wheel to the main triangle to complete this rigid package. 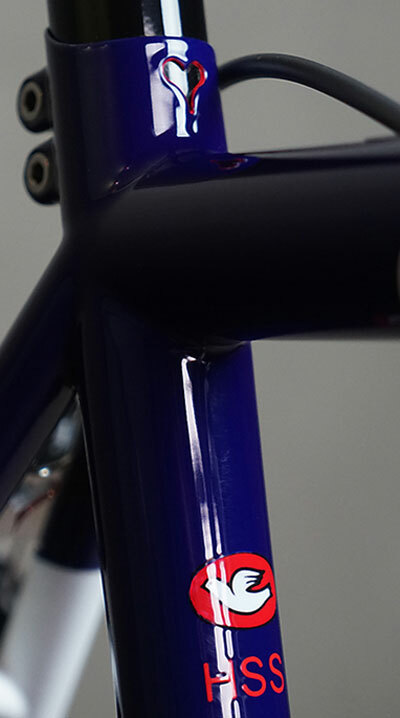 The frame is constructed by fillet brazing using a specially selected suitable brazing rod with 55% silver content. These fillet joins are meticulously hand finished to give a smooth seamless transition from tube to tube. Joining frame tubes by the fillet brazing method and hand finishing the fillets is labour intensive, however the outcome for durability and aesthetic is superior to welding. Clean and functional standard details compliment this quality bespoke hand made frame such as a braze on stainless steel front derailleur boss, fully sealed internal rear brake cable routing in the top tube, double M5 seat post binder bolts, stainless steel dropouts. The top tube can be level or sloping to optimise the aesthetic and engineering. Di2 or EPS electric groupsets make a good companion with the Colossus frame set. Special selection Columbus HSS tubes. Fillet brazed using special high silver content low temperature brazing rods for maximum retention of the tubing’s mechanical properties with minimal distortion, then hand finished. Polished stainless steel “QuickChainger” hands free chain hanging when the rear wheel is removed. Seat tube fits standard 31.6mm diameter seat post. 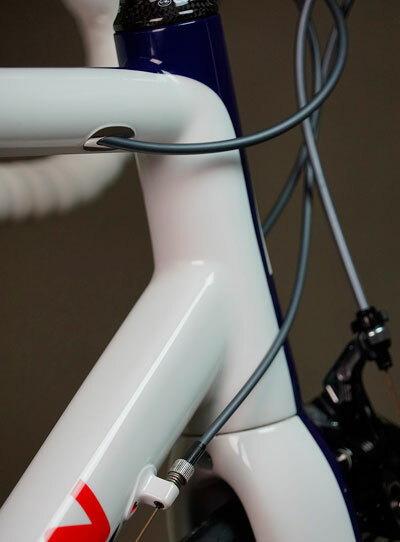 Di2 or EPS internal wire fittings.